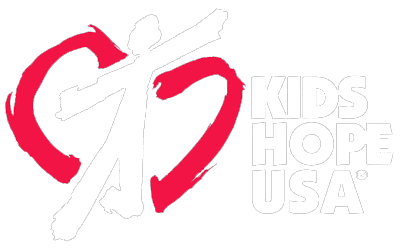 KIDS HOPE USA is a national church-owned, school-based mentoring program that equips a church to build a partnership with its neighborhood public elementary school by providing faithful mentors to at-risk children. One caring adult mentoring a child who may be struggling academically, emotionally or socially for one hour every week can result in a huge impact. When kids feel loved and valued, they are better able to learn, grow, and succeed. Eastside Church of Christ has partnered with DeVaney Elementary school for over a decade and currently has 17 mentors volunteering one hour a week to meet with a child who was recommended by his or her teacher for the program. In addition to providing mentors, Eastside provides a luncheon for the teachers and staff at DeVaney on the Teacher Work Day at the beginning of the school year and collects hats, gloves/mittens, and scarves at Christmas to be given to any child at DeVaney who needs them. ​Every mentoring relationship is supported by a dedicated prayer partner who prays regularly for the mentor, the child, and their relationship. The Kids Hope Director is supported by a leadership team which includes a Prayer Coordinator (Doreen Waldbieser), a Celebrations/Event Coordinator (Polly Bryan), a Match Support Coordinator (Terri Stott) and a Communications Coordinator (Mary Ellen Adams).